Understanding the plight of others may be our only hope. The denial of inequality as a core problem in society will only ensure it's ever growing existence. Even the privileged will ultimately benefit from a more enlightened society, hence, in giving up some privileges for wisdom. Examining the dictionary definitions of some key words can help us better understand our own biases, rooted in the language itself. For instance, some dictionaries define underprivileged as being needy, and needy as lacking in ability, effort, and character. Also, in contrast, other parts of the definitions can be more constructive. I've tried to leave out most of the negative connotations, which I believe do more harm than good. (of a person) not enjoying the same standard of living or rights as the majority of people in a society. deprived, disadvantaged, poor, destitute, in need, in straitened circumstances, impoverished, poverty-stricken, on the poverty line, lower-class; formal penurious. antonym wealthy. having special or excessive rights, advantages, or immunities : in the nineteenth century, only a privileged few had the vote. • [with infinitive ] having the rare opportunity to do something that brings particular pleasure : I felt I had been privileged to compete in such a race. • (of information) legally protected from being made public : the intelligence reports are privileged. a special and excessive right, advantage (or over-advantage), or immunity granted or available only to a particular person or group of people : education is a right, not a privilege | he has been accustomed all his life to wealth and privilege. • something regarded as a rare opportunity and bringing particular pleasure : I have the privilege of awarding you this scholarship. • (also absolute privilege) (in a parliamentary context) the right to say or write something without the risk of incurring punishment or legal action for defamation. • the right of a lawyer or official to refuse to divulge confidential information. • chiefly historical a grant to an individual, corporation, or place of special rights or immunities, esp. in the form of a franchise or monopoly. grant a privilege or privileges to : English inheritance law privileged the eldest son. • (usu. be privileged from) exempt (someone) from a liability or obligation to which others are subject. the state of being equal, esp. in status, rights, and opportunities : an organization aiming to promote racial equality. • Mathematics the condition of being equal in number or amount. • Mathematics a symbolic expression of the fact that two quantities are equal; an equation. ORIGIN late Middle English : via Old French from Latin aequalitas, from aequalis (see equal ). 1 we promote equality for women fairness, equal rights, equal opportunities, equity, egalitarianism; impartiality, evenhandedness; justice. 2 equality between supply and demand parity, similarity, comparability, correspondence; likeness, resemblance; uniformity, evenness, balance, equilibrium, consistency, homogeneity, agreement, congruence, symmetry. It's always disconcerting when seemingly intelligent, well-meaning people, who you care about, don't understand the basic social, racial, and ever widening income inequality issues within their own country, and sometimes even within their own life experiences and field of employment. A recent experience inspired me to post some basic information about the prison industrial complex that I thought everyone already knew. Even if you are aware, it doesn't hurt to review, rethink, re•fact check, and reexamine these important issues once again. As of June 30, 2007, the incarceration rate in state or federal prison or jail for men was 1,406 per 100,000 residents, for women 136 per 100,000 residents. 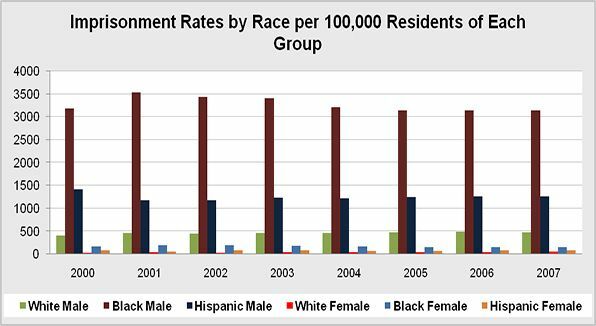 The rate for white men was 773 per 100,000, for black men 4,618 per 100,000, for Hispanic men 1,747 per 100,000. The rate for white women was 95 per 100,000, for black women 348 per 100,000, and for Hispanic women 146 per 100,000. The number of sentenced prisoners under state or federal jurisdiction per 100,000 U.S. residents, by gender, race, Hispanic origin. The new drug laws, which have since become known as the "Rockefeller Drug Laws" established mandatory prison sentences for the unlawful possession and sale of controlled substances keyed to the weight of the drug involved. Generally, the statutes require judges to impose a sentence of 15-years to life for anyone convicted of selling two ounces, or possessing four ounces of "narcotic drug" (typically cocaine or heroin). In 1977 The Committee on New York Drug Law Evaluations, a partnership between the Association of the Bar of the City of New York and The Drug Abuse Council, Inc., issued a report2 that was highly critical of the Rockefeller laws. The Committee found that heroin use and heroin-related crime (the major drug concerns at the time) was as widespread in the middle of 1976 as prior to the enactment of the Rockefeller laws in 1973. Despite the expenditure of $76 million and the appointment of 49 additional judges to handle cases under the new law, it was described as a dismal failure. 1. Contractors who built prisons along with the hundreds of sub-contractors that make specialized prison beds, toilets, window bars, toilets, locks etc. 2. Food services that unload hundreds of tons of inferior food products on our prison population. 3. Clothing manufacturers who manufacture not only guard uniforms but prison uniforms as well, plus the ridiculous clothing that's given to convicts upon release. 4. Other profiteers include gun manufacturers, those who make the chemicals used to kill our citizens, casket makers for the dead ones, the medical profession tasked with keeping the condemned alive until they can be put to death, and even the P.R. operatives who lie to the press about the system and its abuses. This is just the tip of the iceberg that is the system that preys on our citizens rather than attempts to educate and rehabilitate them. 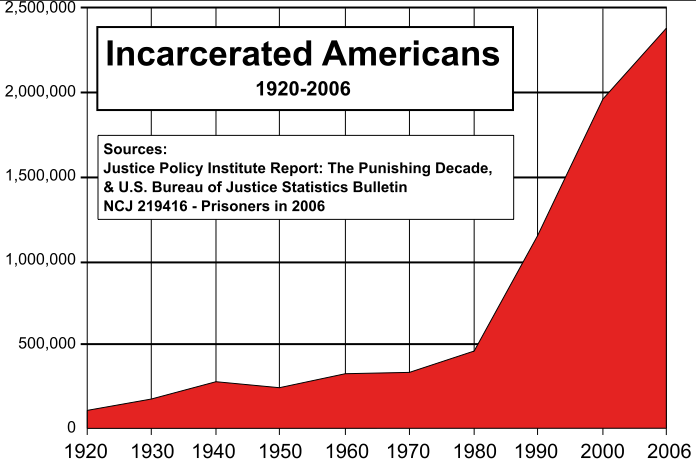 Nearly every family in America has been affected in some negative way by the PRISON INDUSTRIAL COMPLEX.